Wendy Joy Rounds is a mixed media artist who specializes in collage, fibers, mixed media, and assemblage with found objects. 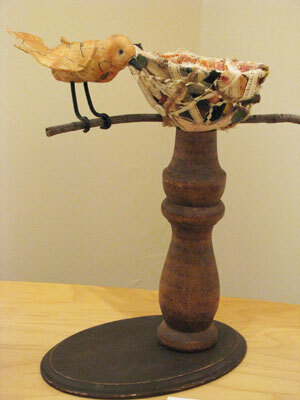 Her current body of work focuses on vignette-style boxes that hang on the wall, many with birds as the subject. A piece of her work invites the viewer to get up close and inspect the tiny world, both inside and outside of the box that holds it. It shows delicate and thoughtfully placed artifacts that tell a story, quite possibly one that an average passerby would not notice or stop to investigate on his own. Born and raised in the Chicago suburbs, Wendy has always been creative. Her siblings left home when she was very young and she had few playmates, so she invented ways to keep entertained. Her interest in dollhouses sparked the direction of sculpture and arrangement, that has been present in her artwork ever since. With parents that enhanced her creative world with sewing, quilting, and woodworking, Wendy tried any type of craft she could get her hands on. She attended Maharishi International University in Fairfield, Iowa and received her BFA in 1991, having done her major studio work in ceramic sculpture. On her own, Wendy furthered her techniques in ceramics while living in the cloud forest of Costa Rica, as well as northern California. Currently she lives and pursues art in Des Moines, Iowa, with her Husband Steve and four children. Currently she shows her work at the Galleria Imago Dei, in Fairfield, IA, and at various galleries and venues throughout the Des Moines area.